A British climber cheated death after falling more than 30ft in the dead of night in a Spanish mountain range and miraculously landing on a tiny ledge. Police said the 69-year-old man was able to call his family in the UK to ask for help and was eventually rescued. He had suffered a foot and rib injury, exhaustion and hypothermia. ‘He was found at 2am, lying on a shelf in a very precarious position and with the real possibility of falling into the void below,’ said a spokesman for the Spanish Civil Guard. The Brit had gone out mountaineering in the Picos de Europa on the borders of Asturias, Cantabria and Castilla and León, one of the most stunning national parks in Spain and Europe. 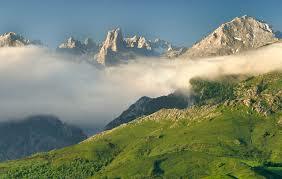 Its dramatic rocky mountain peaks rise to well over 8,000 ft and it has deep vertical gorges. Rescuers say he suffered a fall in the area known as ‘Las Minas del Rabico’ at about 11pm on Saturday night and had to endure hours trapped on the ledge. Thanks to a special app on his mobile, he was able to alert his family back in England, allowing the Consulate to raise the alert with the Civil Guard.